The mini bat selection has not been all that interesting so far on the trip besides finding the '09 World Baseball Classic one. Most of Mik's collection is buried in the garage and we could not confirm what ones he had before the trip, but we knew he already had either a natural wood or dark blue Padres logo one. Thus the choices were either this light blue one or a pink one. Obviously, Mik went for the light blue one. 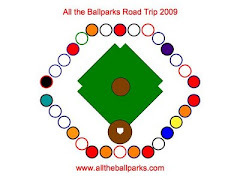 All of them just had the same San Diego Padres logo. When we found the 40th Anniversary Ball for my collection we had hoped there would be a mini bat with that logo, too.